This cereal is described on the front of the box as a "crunchy sweetened wheat cereal with real cinnamon." The cereal pieces look like inflated Cheerios dusted heavily with cinnamon. Addition text on the box encourages consumers to "compare to Cinnamon Toast Crunch" for taste and value. The ingredients in the cereal as of 2013 were simply wheat flour, sugar, high oleic canola oil, cinnamon and salt. 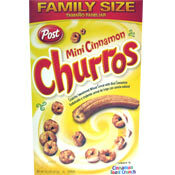 In the summer of 2013, Post's website said, "The sweet cinnamon crunch of Mini Cinnamon Churros is a delicious way to start your day, and provides several important vitamins and minerals." What do you think of Mini Cinnamon Churros? Hands down favorite cereal. They need to bring it back. 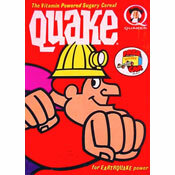 When I was growing up, I ate this cereal and hope to again.